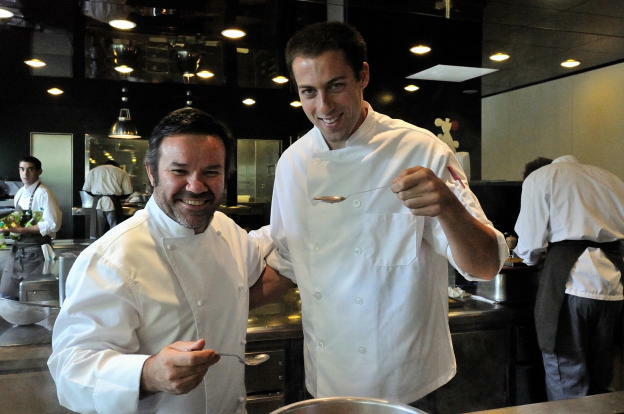 On my first day at La Maison Troisgros in Roanne, France, chef Michel Troisgros told me something extremely important. Before entering the kitchen he said, "Don't be afraid to taste anything. You must taste everything. You must taste all the time. This is the only way you can learn." Mind you this is coming from a famed chef whose family restaurant has had three Michelin stars for 42 years, I think he knows what he's talking about. So, I thought; taste top-level ingredients, prepared with precise French techniques, day in and day out? Count me in! As a professional swimmer I've spent years refining my technique in the pool and the weight room. I consider myself an expert at what I do, but I've been practicing these movements for well over a decade. Professional chefs do much the same thing but in a very different environment. So, from day one at Troisgros, I took Michel's advice. Everywhere I went in the kitchen among these great chefs, I tasted. I smelled. I went back and smelled again. I tasted again. Much of the time my brain marveled at how they prepared such silky textures, such robust yet delicate flavors. After a month in the kitchen, much of what they craft still slowly rocks me into a trance. The food can have a seductive, almost sexual effect. Take the Sole a la Ciboulette with its simple sauce of fish stock, cream, butter, and chives. Nothing complex but it hits you with a burst of absurd flavor, creating the excitement of what could only be your first kiss. Before you even know it the sauce is gone and you're left with the memory of something smooth, soft, and exotic yet simple. Am I exaggerating? Don't kid yourself, this dish is nothing short of a food-centered love story. When I walk away from tasting something, I try to imagine each ingredient separately. Close my eyes, shift my mind into a dream state where the fish stock, cream, butter, and chives are floating around separately in space. I can still taste the lingering delicacy on my tongue, which I use as a baseline. The tantalizing flavors keep my palate aroused long after the content has melted away. In my mind I touch each ingredient with my finger and in the most precise and simple way I try to burn the flavor and smell into my mind. Once I've touched each part, I mold them back together into what I'd previously tasted. Gradually the link between taste, smell, and ingredient becomes one. I'm getting there, I'm learning. Often I go back and taste again a few minutes later. Smell it four or five times. Michel says, "cooking is a lot like swimming, it takes repetition. You must do it over and over and over. Taste and smell over and over." Repetition in the kitchen may not be as good for my muscles as swimming, but my senses sure love what's going on in the kitchen more than the chlorinated pool. Every day seems like a new achievement for my palate and sense of smell. Michel was right, with repetition and experience I'm getting more sophisticated and knowledgeable. My goal is to take what I'm learning in this truly gourmet setting and use it to make delicious food with a focus on health. I want to help others experience culinary delights while also living healthy lifestyles, which is precisely why I founded my company AthleticFoodie. That journey is just beginning for me. For now, continue tasting my friends, it truly is a great way to becoming a better cook.